separate goto and failure transitions. to hold each state, otherwise we use 2 bytes. - This version of the MPM is heavy on memory, but it performs well. swap, this is the MPM to go for. Do a proper analyis of our existing MPMs and suggest a good one based on the pattern distribution and the expected traffic(say http). Tried out loop unrolling without any perf increase. Need to dig deeper. Irrespective of whether we cross 2 ** 16 states or not,shift to using uint32_t for state type, so that we can integrate it's status as a final state or not in the topmost byte. We are already doing it if state_count is > 2 ** 16. Test case-senstive patterns if they have any ascii chars. If they don't treat them as nocase. Carry out other optimizations we are working on. hashes, compression. Definition at line 79 of file util-mpm-ac-bs.c. Definition at line 81 of file util-mpm-ac-bs.c. Helper structure used by AC during state table creation. Definition at line 95 of file util-mpm-ac-bs.c. References MpmTableElmt_::AddPattern, MpmTableElmt_::AddPatternNocase, StateQueue_::bot, MpmPattern_::ci, SCACBSPatternList_::cs, MpmCtx_::ctx, MpmTableElmt_::DestroyCtx, MpmTableElmt_::DestroyThreadCtx, SCACBSCtx_::failure_table, SCACBSCtx_::goto_table, MpmPattern_::id, MpmTableElmt_::InitCtx, MpmTableElmt_::InitThreadCtx, MpmPattern_::len, MpmCtx_::memory_cnt, MpmCtx_::memory_size, MPM_AC_BS, mpm_table, MpmTableElmt_::name, SCACBSOutputTable_::no_of_entries, SCACBSCtx_::output_table, SCACBSCtx_::parray, MpmCtx_::pattern_cnt, SCACBSCtx_::pid_pat_list, SCACBSOutputTable_::pids, MpmTableElmt_::Prepare, MpmTableElmt_::PrintCtx, MpmTableElmt_::PrintThreadCtx, MpmTableElmt_::RegisterUnittests, SC_AC_BS_FAIL, SC_AC_BS_STATE_TYPE_U16, SC_AC_BS_STATE_TYPE_U32, SC_ERR_AHO_CORASICK, SC_ERR_MEM_ALLOC, SCACBSAddPatternCI(), SCACBSAddPatternCS(), SCACBSDestroyCtx(), SCACBSDestroyThreadCtx(), SCACBSInitCtx(), SCACBSInitThreadCtx(), SCACBSPreparePatterns(), SCACBSPrintInfo(), SCACBSPrintSearchStats(), SCACBSRegisterTests(), SCACBSSearch(), SCFree, SCLogCritical, SCLogError, SCMalloc, SCRealloc, MpmTableElmt_::Search, SCACBSCtx_::single_state_size, SCACBSCtx_::state_count, STATE_QUEUE_CONTAINER_SIZE, SCACBSCtx_::state_table_mod, SCACBSCtx_::state_table_mod_pointers, SCACBSCtx_::state_table_u16, SCACBSCtx_::state_table_u32, StateQueue_::store, and StateQueue_::top. Add a case insensitive pattern. Although we have different calls for adding case sensitive and insensitive patterns, we make a single call for either case. No special treatment for either case. mpm_ctx Pointer to the mpm context. pat The pattern to add. flags Flags associated with this pattern. Definition at line 1348 of file util-mpm-ac-bs.c. Add a case sensitive pattern. Although we have different calls for adding case sensitive and insensitive patterns, we make a single call for either case. No special treatment for either case. Definition at line 1373 of file util-mpm-ac-bs.c. Definition at line 1052 of file util-mpm-ac-bs.c. References SCACBSPatternList_::cs, MpmCtx_::ctx, MpmCtx_::init_hash, MpmCtx_::max_pat_id, MpmCtx_::memory_cnt, MpmCtx_::memory_size, MPM_INIT_HASH_SIZE, MpmFreePattern(), SCACBSCtx_::output_table, SCACBSCtx_::parray, MpmCtx_::pattern_cnt, SCACBSCtx_::pid_pat_list, SCACBSOutputTable_::pids, SC_AC_BS_STATE_TYPE_U16, SC_AC_BS_STATE_TYPE_U32, SCFree, SCACBSPatternList_::sids, SCACBSCtx_::state_count, SCACBSCtx_::state_table_mod, SCACBSCtx_::state_table_mod_pointers, SCACBSCtx_::state_table_u16, and SCACBSCtx_::state_table_u32. Referenced by MpmACBSRegister(), and SCACBSPrintInfo(). Destroy the mpm thread context. mpm_thread_ctx Pointer to the mpm thread context. Definition at line 1033 of file util-mpm-ac-bs.c. References MpmThreadCtx_::ctx, MpmThreadCtx_::memory_cnt, MpmThreadCtx_::memory_size, SCACBSPrintSearchStats(), and SCFree. Definition at line 999 of file util-mpm-ac-bs.c. References MpmCtx_::ctx, MpmCtx_::init_hash, MpmCtx_::memory_cnt, MpmCtx_::memory_size, MPM_INIT_HASH_SIZE, SCMalloc, and SCReturn. Init the mpm thread context. matchsize We don't need this. Definition at line 979 of file util-mpm-ac-bs.c. References MpmThreadCtx_::ctx, MpmThreadCtx_::memory_cnt, MpmThreadCtx_::memory_size, and SCMalloc. Process the patterns added to the mpm, and create the internal tables. Definition at line 888 of file util-mpm-ac-bs.c. 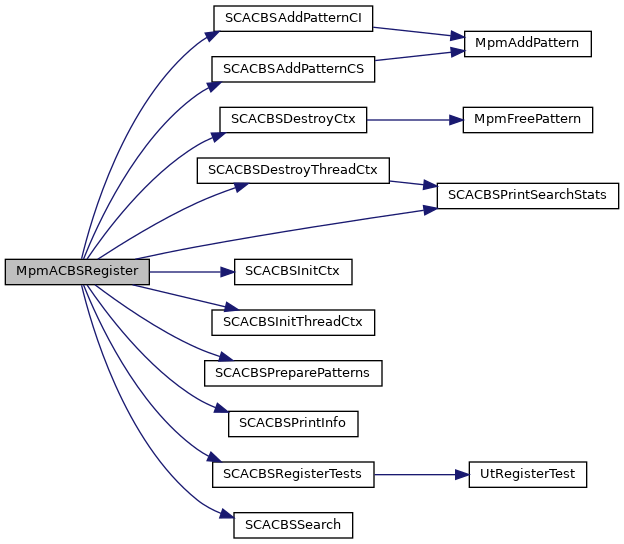 References SCACBSPatternList_::cs, MpmCtx_::ctx, MpmPattern_::flags, MpmPattern_::id, MpmCtx_::init_hash, MpmPattern_::len, MpmCtx_::max_pat_id, MpmCtx_::memory_cnt, MpmCtx_::memory_size, MPM_INIT_HASH_SIZE, MPM_PATTERN_FLAG_NOCASE, MpmFreePattern(), MpmPattern_::next, MpmPattern_::original_pat, SCACBSCtx_::parray, SCACBSPatternList_::patlen, MpmCtx_::pattern_cnt, SCACBSCtx_::pattern_id_bitarray_size, SCACBSCtx_::pid_pat_list, SC_ERR_MEM_ALLOC, SCFree, SCLogDebug, SCLogError, SCMalloc, SCACBSPatternList_::sids, MpmPattern_::sids, SCACBSPatternList_::sids_size, MpmPattern_::sids_size, and SCACBSCtx_::single_state_size. Definition at line 1393 of file util-mpm-ac-bs.c. References MpmCtx_::ctx, DE_QUIET, DetectEngineCtxFree(), DetectEngineCtxInit(), DetectEngineThreadCtxDeinit(), DetectEngineThreadCtxInit(), DetectEngineCtx_::flags, MpmCtx_::maxlen, MpmCtx_::memory_cnt, MpmCtx_::memory_size, MpmCtx_::minlen, MPM_AC_BS, DetectEngineCtx_::mpm_matcher, MpmAddPatternCI(), MpmAddPatternCS(), MpmInitCtx(), Signature_::next, PacketAlertCheck(), MpmCtx_::pattern_cnt, PmqFree(), PmqSetup(), SCACBSDestroyCtx(), SCACBSDestroyThreadCtx(), SCACBSInitThreadCtx(), SCACBSPreparePatterns(), SCACBSSearch(), DetectEngineCtx_::sig_list, SigCleanSignatures(), SigGroupBuild(), SigGroupCleanup(), SigInit(), SigMatchSignatures(), SCACBSCtx_::state_count, UTHBuildPacket(), and UTHFreePackets(). Definition at line 1380 of file util-mpm-ac-bs.c. References MpmThreadCtx_::ctx, SCACBSThreadCtx_::total_calls, and SCACBSThreadCtx_::total_matches. Referenced by MpmACBSRegister(), and SCACBSDestroyThreadCtx(). Definition at line 2477 of file util-mpm-ac-bs.c. The aho corasick search function. pmq Pointer to the Pattern Matcher Queue to hold search matches. buf Buffer to be searched. Definition at line 1145 of file util-mpm-ac-bs.c. References MpmCtx_::ctx, SCACBSOutputTable_::no_of_entries, SCACBSCtx_::output_table, SCACBSCtx_::pattern_id_bitarray_size, SCACBSCtx_::pid_pat_list, SCACBSOutputTable_::pids, SC_AC_BS_STATE_TYPE_U16, SC_AC_BS_STATE_TYPE_U32, SCMemcmp, SCACBSCtx_::state_count, SCACBSCtx_::state_table_mod_pointers, and u8_tolower.